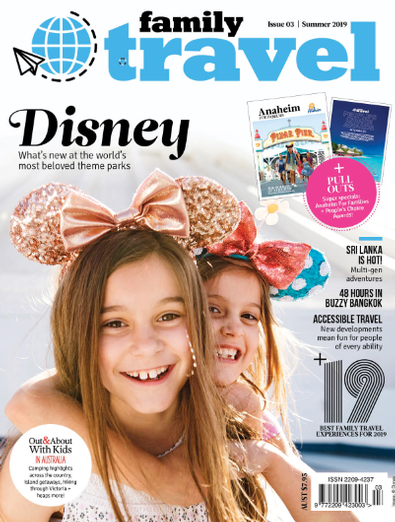 Published quarterly and timed to coincide with school holidays, Family Travel is your ultimate resource - everything you need to enjoy the school holidays. Whether you’re planning a holiday, a day trip or looking for activities to entertain your kids, you’ll find it all here. We explore destinations, within Australia and overseas, which allow families to be more active and adventurous. We look at the latest film, DVD, game and toy releases, attractions, exhibitions and to give readers a truly comprehensive entertainment overview. Our Calendar of Events is a quarterly guide to family friendly events and attractions across the whole of Australia. It’s the perfect reference guide when planning weekend and school holiday activities. I love this mag---so much info and no perceived travel brochure articles saying everything is good!! I wish we could have some sort of guide so that we have all this info in one place. I wish all parents in Australia would read this enjoyable, helpful, beautifully produced magazine. It&apos;s great for finding out things to do with your kids, not just in the school holidays, but for every season of the year. In these times of childhood obesity, this magazine gives you fun, useful hints and tips on family friendly activities and places to go where kids are welcome and happy. Thanks! I have become addicted! Great magazine with lots of school holiday ideas... the best way to travel with the kids, ideas on where to go. One of my favourite sections is the Whats On guide that lists lots of events and activites for my hubby and I to do with the kids in the school holidays. The hotel we found in the mag gave us a great discount... in fact a lot of hotels have family rates that would&apos;ve taken me ages to find elsewhere! Definately a must read! This magazine is just what we were looking for because we need to know wherever we go that the kids are going to enjoy it too. Very Good...I found it very informative about destinations and once we were there there was loads of info about activiites. A must for all parents who want to have active kids! !